Is your child learning how to tie their shoelaces? Then this might be a delightful little treat for them. Space Ranger Fred is a little boy called on to help the famous Zando Centauri on a vitally important mission - to help Emperor Gandori. The problem? The people on Gandori's planet have never used shoelaces, and he has a new pair of shoes with them that he needs to learn how to tie! Fred to the rescue! 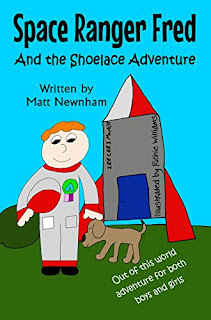 This is a fun read - though perhaps a little long for younger readers to enjoy at a single bedtime reading, but with six chapters it makes a great read at a chapter a night across a week. My stepson, Dylan, who is six, enjoyed it in two sittings, even though it had to contend with his favourites such as If I Ran The Zoo and The Dinosaur That Pooped A Planet. He didn't quite engage with the first two chapters, but once the mission he was under way, he loved it. His review is in the video below. Will Fred complete his mission and get back home to his pet dog, Jupiter? Read and find out! And the bonus? Dylan tied his first shoelace by following the instructions in the book. Result! Space Ranger Fred and the Shoelace Adventure is available on Amazon.